The slide into financial no man’s land begins whenever the ECB has no excuse for propping up Greek banks. The central bank can overlook a June 30 non-payment to the IMF, even if a deposit run leads to capital controls. But if Greece stiffs the ECB on July 20, it gets much harder. 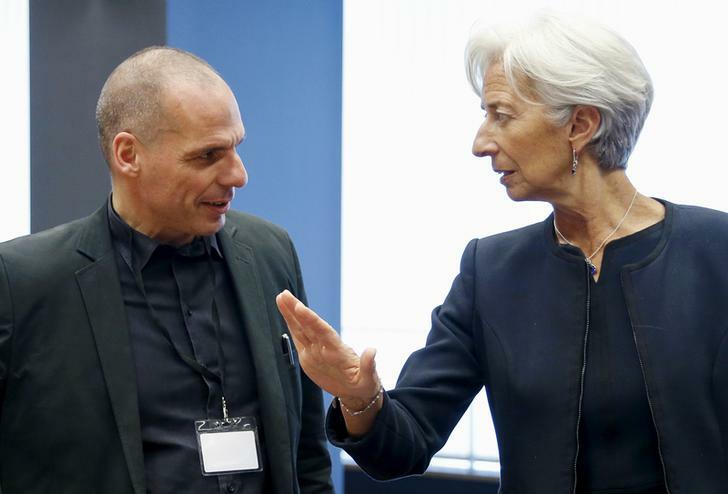 Greek Finance Minister Yanis Varoufakis listens to International Monetary Fund (IMF) Managing Director Christine Lagarde (R) during an euro zone finance ministers meeting in Luxembourg, June 18, 2015. The European Central Bank’s governing council will on June 19 hold their second special conference call in three days, to consider adding more emergency liquidity for Greek banks facing a quickening drain on their cash, two persons close to the situation told Reuters. European Council President Donald Tusk said in a statement he had summoned heads of state and government of the euro area to meet in Brussels at 1700 GMT on June 22 to discuss Greece “at the highest political level”. IMF Managing Director Christine Lagarde said further dialogue was needed “with adults in the room”. The IMF dashed any hope that Athens could avert default if it fails to repay a 1.6 billion euro ($1.8 billion) loan by the end of June. Greek savers pulled out some 2 billion euros between June 15 and June 17 after weekend negotiations collapsed in Brussels, senior banking sources told Reuters. That is double the amount that the ECB granted Greek banks in extra emergency liquidity assistance (ELA) only on June 17. Asked at the Eurogroup meeting whether Greek banks would be open on June 19, ECB Executive Board member Benoit Coeure said: “Tomorrow, yes. Monday, I don’t know”, according to officials with knowledge of the talks.